Just a week before Sea Otter, BMC, the Swiss bike brand best known for bikes found leading the way in the Tour de France and Kona Ironman, officially launched two new e-bikes. 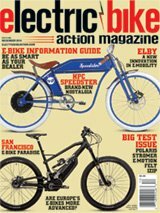 Admittedly late to the e-bike party, BMC actually first showed off an e-bike back in 2016, but it wasn’t until this year that they finally got production of the Trailfox Amp and Speedfox Amp ramped up and delivered to America. We had a chance to ride them in Santa Cruz at the launch and came away impressed with both the 27.5-plus-wheeled Trailfox Amp and the Speedfox Amp that rolls on 29-inch wheels. Both are based on current non-electric versions, with the “Amp” name signifying the addition of pedal assist. BMC reworked the geometry slightly to allow for the added weight and power of Shimano’s STEPS E8000 powerplant, as well as shortening the crankarms to provide improved handling with just enough clearance to help avoid pedal strikes. The E8000 system was chosen for its size and ability to keep the rear chainstays as short as possible. The suspension, too, was tuned for the weight and power, and they recalculated the APS kinematics and pivot points as well. All that work translates into a duo of e-MTBs that BMC claims handles as well as their non-electric counterparts. They widened and stiffened the suspension linkage to handle the extra forces, and that coupled with the stiff carbon chassis makes the bike feel really planted, even on fast, tight trails. The bikes all use BMC’s own Twin Hollow-Core frame construction that encloses and protects the battery and motor and offers easy internal cable routing. They all have quad-piston brakes with 200mm rotors front and rear, with a magnet in the rear rotor and the speed sensor built into the rear dropout for protection and a neater look. They also use a dual-tone colorway, with the battery area partially black to cosmetically “hide” some of the battery. The Trailfox Amp Two is not the second version of the Trailfox AMP, but represents a higher level of component spec. There is a Trailfox Amp One available in Europe, but BMC opted to only bring their level two and three bikes to the U.S. The level-one bikes are spec’d high enough to reach into five-figure pricing. The Trailfox Amp is set up with 27.5×2.8-inch Maxxis High Roller plus-sized tires with aggressive knobs and 150mm of travel front and rear, thanks to RockShox suspension that keeps those tires on the ground. It also features a 150mm dropper seatpost, which we found perfect for the trails we rode with long climbs and technical, often rocky descents. The Speedfox Amp platform is set up as a 29er with 130mm of RockShox suspension travel. Both the Two and Three versions have a Shimano 1×11 (34×11-46) drivetrain but of different spec. They both use BMC’s Big Wheel Concept, which is intended to make the big 29-inch wheels provide a more nimble, stable and efficient ride. Tires of choice are 29×2.35-inch Maxxis Forekaster tires, and they roll easily over everything. The Speedfox Amp Three uses Shimano SLX shifters with Deore brakes, a RockShox Monarch shock and RockShox Revelation RC fork. The higher-end Two model has Shimano XT components, the same Revelation fork and a Fox Float DPS shock. We think the Three is even more impressive with the performance-to-price ratio. The BMC Amp brigade charges easily uphill. Climbing was as fun as descending! All of these bikes proved as capable as you’d expect from a performance-oriented brand like BMC. We weren’t disappointed riding any of them; instead, we were more inspired to ride more. A 27-mile trek through the woods in Santa Cruz was a rider’s dream, especially on these bikes. These capable machines devoured the trails like a ravenous wolf at a bunny convention. We weren’t sparing on the batteries, and we still came back with nearly half the battery left!